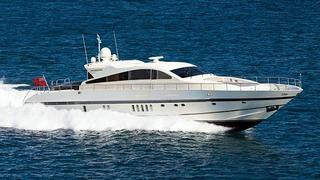 Steen Christensen at Camper and Nicholsons tells me he's now signed the 27m Leopard motor yacht Oscar for sale. Launched by Arno in March 2011 as the 34th hull in this series, Oscar was designed by Paolo Caliari. Accommodation is for six guests in a full beam master suite and two double staterooms while twin 2185hp MTU engines give her a top speed exceeding 35 knots. Lying in Spain, Oscar is asking €4.5 million.